Attitude recently launched six new lipstick shades alongwith other range of cosmetics. Being a lipstick addict I had to try them out. So I decided to first try out the tester pack before I buy the full sized products. But you can buy the tester pack only if you purchase two full sized lipsticks. I was like 'say what?' So I had to choose two lipstick shades. I was worried about choosing a wrong shade which would be such a waste. After thinking about the shades, I decided to choose 'Rose Love' and 'Satin Peach'. Now let me tell you why. I can never go wrong with any lipstick which has the name Rose. This shade always suits me. So I was sure about this one. So why Satin Peach? I chose this shade as I didn't have a peach colour in my collection. I'm so glad about my choice as both the shades turned out to be really good. So no regrets. The other shades besides these two are not that good (this is just my opinion). A detailed review on the tester pack will be up on the blog very soon. So today, here is my take on the shade Satin Peach. 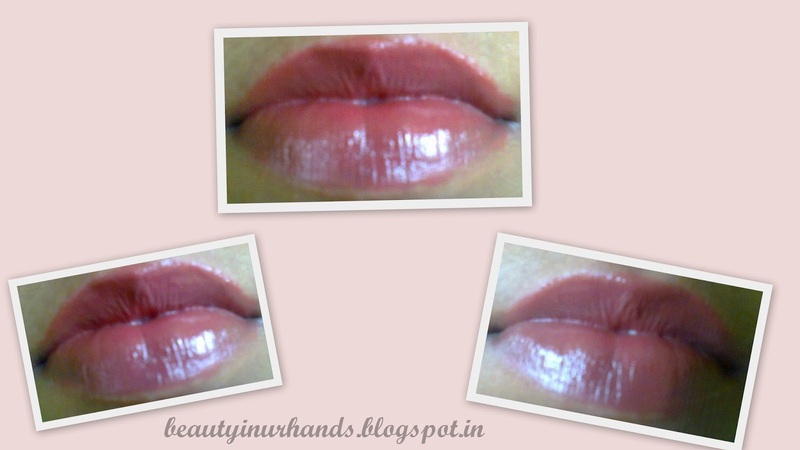 Just like their other lipsticks, this one too glides on very smoothly on my lips. There is no need of using a lip balm. I like the fact that it is so creamy and moisturizing. It doesn't settle into fine lines nor does it bleed. My lips stay hydrated for long. You need to swipe at least more than three times to get a good amount of colour on the lips. The fragrance is not bothersome at all. In fact you won't even notice it. This lipstick stays on my lips for around 4 hours and fades away evenly. No dry patches whatsoever. Even when the lipstick wears off my lips do not feel dry. This particular shade does not contain any glitter particles.The fact that it contains SPF 15 is an added bonus. This is the main reason I prefer Attitude brand when it comes to lipsticks. In my opinion, Satin Peach is the perfect shade for office wear as it is not a loud shade and looks natural. I love wearing it to work. 2. Difficult to identify a particular shade if you own many of these. Looks like a lovely color!